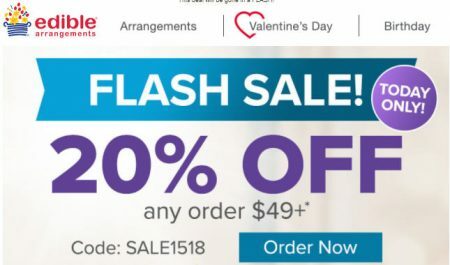 Edible Arrangements is having a Flash Sale. Today only, save 20% off any $49+ purchase when you enter the promo code SALE1518 at checkout. The code is valid 1-day only on Monday, January 15, 2018 until 11:59pm PST. I’ve tested the code and can verify that it works. Edible Arrangements offers free pickup at a store near you or same-day delivery. For a limited time, save 20% off any order $49+ per recipient (excluding tax and delivery fees)! Offer expires on 1/15/18 at 11:59pm PST. Enter code “SALE1518” at checkout to redeem. Cannot be used on previous orders & already discounted products, cannot be combined with other coupons, coupon codes or promotional offers. No substitutions. Not valid on previous purchases. Offers valid for a limited time only, and may be terminated without notice. Valid at participating locations only, while supplies last. Excludes fruit salads, smoothies, fruit parfaits, single pieces of dipped fruit, pineapple pops, and 6-count boxes. Click here to visit Edible Arrangements website for more details. Click here to find an Edible Arrangement store near you.